You only need to install a browser extension. Facebook has quietly launched a new feature for Live videos that makes sharing your screen a painless experience. Instead of downloading a third-party service, you can now simply click the "Share Screen" button that appears once you enter the Live module on desktop. TheNextWeb's Matt Navarra has discovered the new sharing option, which doesn't seem to be experimental, because we were able to activate the feature for our account even outside the US. 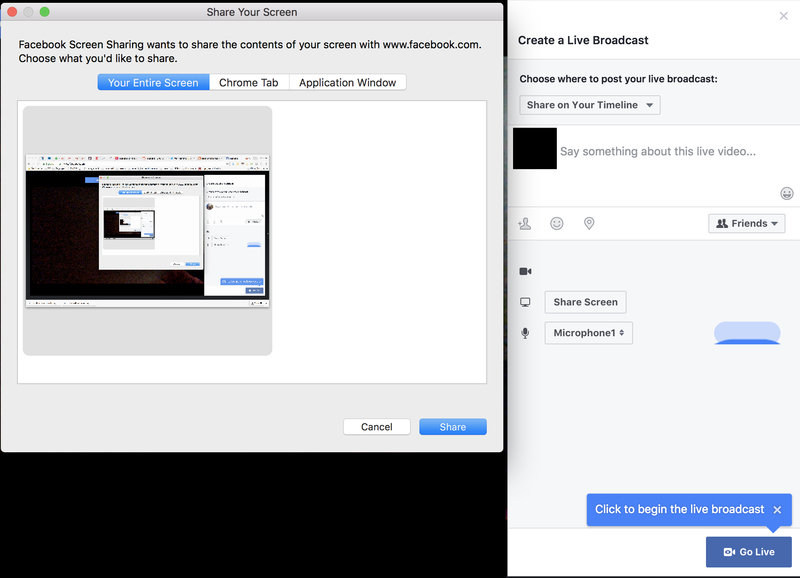 When you click on the Share Screen option for the first time, a pop up will ask if you want to add the "Facebook Screen Sharing" extension. We tested it out and successfully installed it on Chrome. After that, a module will appear asking if you want to share your entire screen or if you just want to share a specific tab or a specific application. As TheNextWeb said, it's pretty basic -- you can't insert a video of yourself on the lower corners while you stream your screen, for instance. It doesn't produce the clearest videos either, but if you don't stream for a living anyway, the option looks good enough to use whenever you want to share with friends.